NEW YORK—”Rigoletto” is Giuseppe Verdi’s opera based on a Victor Hugo play, “Le roi s’amuse” (“The king takes his amusement”), about the corrupt king of France during the 16th century, François I. When the opera ran into censorship problems, Verdi and his librettist Francesco Maria Piave moved the locale to Italy and made the amoral ruler the Duke of Mantua. 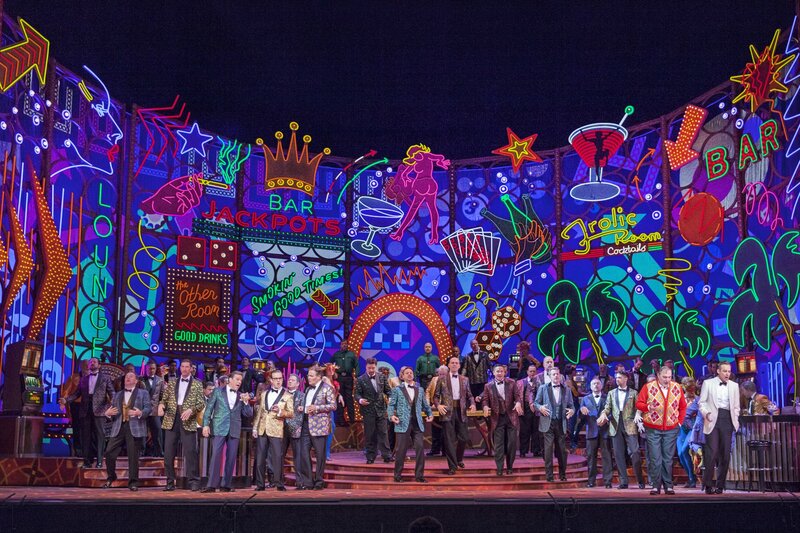 The Metropolitan Opera’s production, under Michael Mayer, updates the action to 1960 Las Vegas and the Duke is a Sinatra-style nightclub singer. 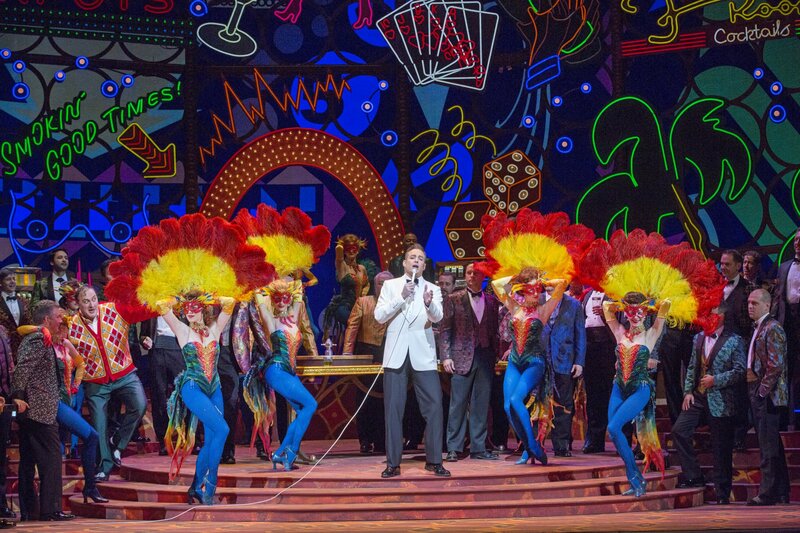 I still have my reservations about director Mayer’s nightclub vision for the opera. While the characters are singing the words penned by Piave, the English subtitles have been changed so that they sound like the dialogue in a Rat Pack movie, such as the original “Ocean’s Eleven.” Women are called “baby” and bad guys “lousy rats.” This choice leads to occasional laughter, which is the opposite of the composer’s intention. The hunchback Rigoletto, who is the Duke’s court jester in the original, is presented here as a Don Rickles-style nightclub comic. When the opera begins, the Duke expresses his credo, “Questa o quella per me pari sono” (“This girl or that girl are just the same to me”). He seduces young women with the assistance of his courtiers. Monterone, the outraged father of one of his victims, (presented here for some reason as an Arab sheik) is ridiculed by Rigoletto. Monterone curses Rigoletto. Gossip spreads among the Duke’s entourage that Rigoletto is keeping a young mistress. It turns out that the girl is the jester’s daughter Gilda, whom he keeps secluded. Meanwhile, the Duke has been pursuing the girl, pretending he is a poor student. The courtiers kidnap the girl and deliver her to the Duke’s bedroom. When Rigoletto discovers what happened, he recalls the curse. When Gilda leaves the Duke’s room, she tells her father of the kidnapping and her seduction. Rigoletto hires a killer to assassinate the Duke. However, Gilda takes the place of her amoral lover, and it is her body that is delivered to her father. When Rigoletto hears the Duke singing in the distance, he unveils the body and is shocked to discover it is his dying daughter. Rigoletto realizes that Monterone’s curse has come to pass. The opera contains many familiar arias, each of which helps delineate the characters. Included are the tenor’s (Duke) “La donna è mobile” (“Woman is fickle,” even though he is the fickle one) and “Questa o quella” (which he sings with a microphone in hand); the soprano’s (Gilda) “Cara nome” and the baritone’s (Rigoletto) “Pari siamo”; and the raging “Cortigiani, vil razza dannata”; as well as moving father-daughter duets and a virtuoso quartet in the last act. The cast is outstanding. 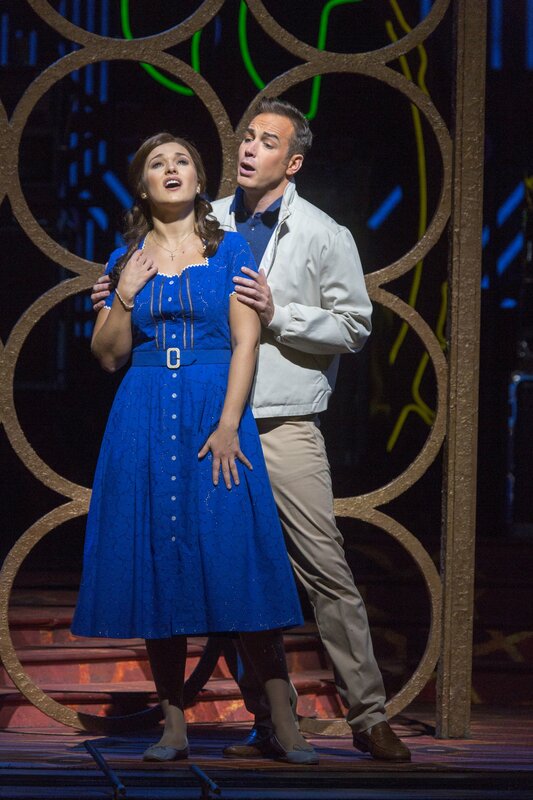 As the Duke, tenor Stephen Costello has a golden tone and sang with style. The Philadelphia native, a past winner of the Richard Tucker vocal competition, even looks the part of a matinee idol. As Rigoletto, George Gagnidze again demonstrated why he is in the top rank of current baritones. He captured all of the hunchback/comic’s mood swings, from his bitter humor toward Monterone to his tender duet with his daughter, to his rage at the courtiers who kidnapped her. Soprano Olga Peretyatko, looking like the young Debbie Reynolds, is a perfect Gilda. Not only is her singing beautiful, but she also moves with the grace of a dancer. Bass Stefan Kocan has made a specialty of the cold-blooded killer Sparafucile, and he is as scary as ever. Mezzo-soprano Katarina Leoson, in her Met Opera debut, is impressive as Sparafucile’s hot sister Maddalena. Conductor Pablo Heras-Casado is right at home with the music. I still have my reservations about Mayer’s vision of the opera. 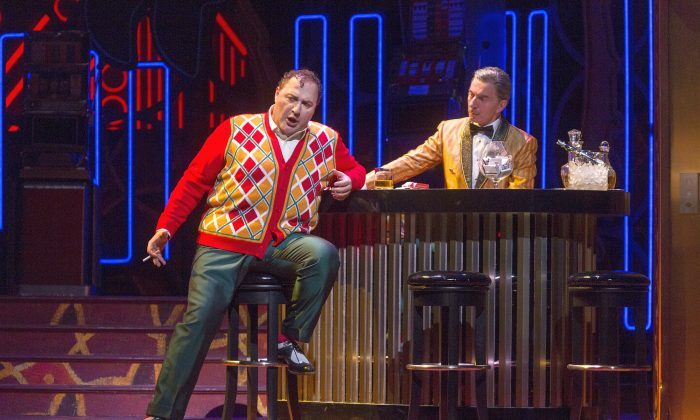 While the set by Christine Jones, the costumes by Susan Hilferty, and the lighting by Kevin Adams are eye-catching, the Las Vegas theme and especially the new English translations undercut the tragic emotions that Verdi’s music conveys. Nevertheless, “Rigoletto” is one of the greatest operas and the singing and acting at the Met’s performances are world-class. 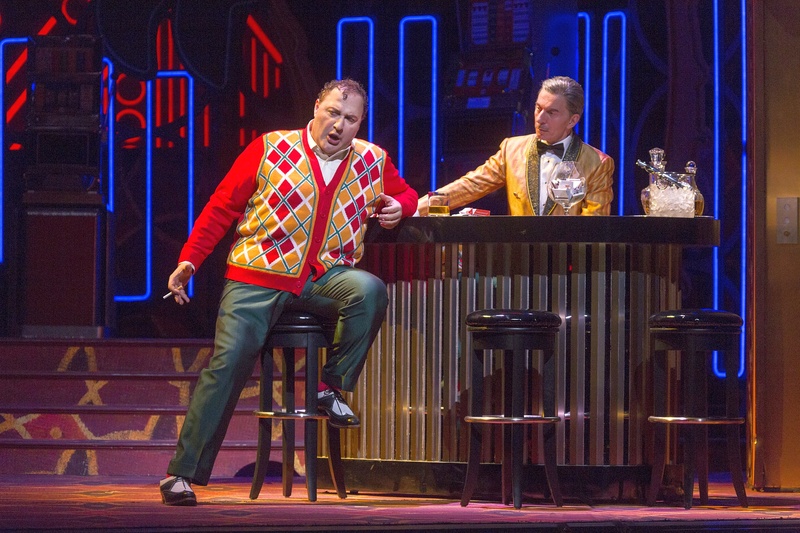 “Rigoletto” is running intermittently at the Metropolitan Opera until Dec. 17. Zeljko Lucic sings the title role, and Piotr Beczala the Duke, starting Nov. 13, and Nadine Sierra sings Gilda from Dec. 2. With the Met's top-flight orchestra, chorus, and strong cast, the music of “Turandot” casts a spell.